1:1:1 is a series of small publications in which printing matter converges with the subject matter, the image with the text, the reproduction with the original and ‘the designer’ and ‘the printer’ with ‘the client’. 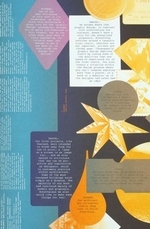 An artist, designer or musician is the point of departure for each of the numbers in this series, and the subject of conversation is the basis for investigating graphic design and printing as a form of expression. 1:1:1 is an initiative of Niessen & de Vries. The upcoming next 3 booklets will be made with Klavers & van Engelen (fashion designers), Scheltens & Abbenes (photographer/stylist) and Metahaven (graphic designers). The series then continues at least for 10 booklets (that will be bound in a 1:1:1 book).